"The grass-blade, like a long green ribbon, streams from the sod into the summer, checked indeed by the frost, but anon pushing on again, lifting its spear of last year's hay with the fresh life below." When the beauty of the earliest grasses is passing the Fescues appear, and in the calendar of the grasses mark the beginning of summer. For a short time they take the primary position in the fields. 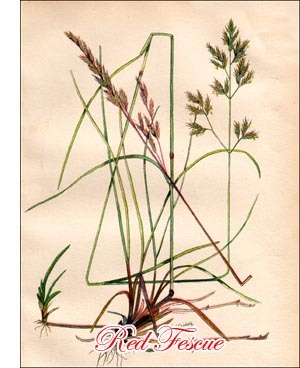 Slender Fescue and Sheep's Fescue are among the first to bloom, and closely following the opening of their flowers the graceful stems of Meadow Fescue, abundant in pastures and meadows, are seen also by the wayside bending over ripening spikes of Sweet Vernal-grass.